SALT LAKE CITY, Utah – Providing the unmistakable sound of a 12-string guitar and its chime, jangle and harmonic richness, HARMAN’s DigiTech today introduced the Mosaic Polyphonic 12-String Effect Pedal. A 12-string guitar features two courses (pairs) of six strings tuned either in unison or an octave apart, doubling each string of a standard six-string guitar to give a 12-string a fuller sound with a bell-like sparkle and a natural chorus effect. The Mosaic utilizes advanced polyphonic pitch shifting and “intelligent” doubling algorithms to approximate the sound of a 12-string using any electric or amplified acoustic guitar. 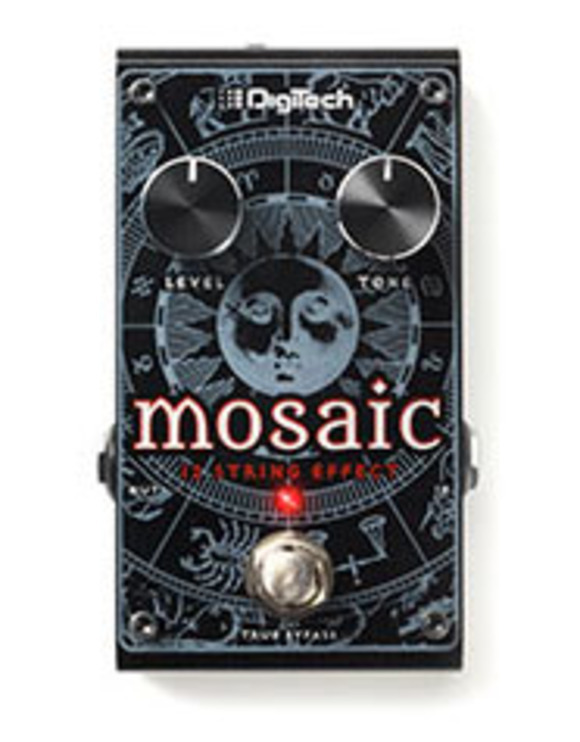 The DigiTech Mosaic features a Level control that adjusts the amount of the 12-string effect intensity, and a Tone control that shapes the overall brightness of the effect. Whether playing single notes, arpeggios or full chordal strums, Mosaic tracks every nuance of a player’s picking and dynamics, to deliver rich harmonic complexity with crisp octave shimmer and balanced low-end response. The Mosaic offers true bypass operation, which keeps the unaffected tone of the instrument intact when the 12-string effect is not in use. The Mosaic has a compact, pedalboard-friendly metal enclosure, includes a power supply, and features a bright red LED for easy visibility on any stage. The DigiTech Mosaic Polyphonic 12-String Effect Pedal will be available in December 2014 at a suggested retail price of $187.44 MSRP.